A few years ago Hackaday featured a laminar project which recently inspired [Kurt] to create his own. His goal is to create a computer controlled night time light show synchronized with music. The laminar nozzle shown in the picture above is built with 800 drinking straws all placed in parallel inside a 4″ PVC pipe. The water input is a 3/4″ garden hose adapter, perpendicular to the flow of the output nozzle. The built therefore consists of cleaning sponges placed near the water inlet, followed by the straws and an inch gap to the exit nozzle. To get a nice flow, the edge of the exit nozzle must be as sharp as possible. [Kurt] purchased a brass pipe end cap, drilled a hole in it and sanded it to create a sharp inner edge. For the lights, he used 2 high power LEDs mounted with 3mm fiber optic cables, driven at around 5 Watts. The link to the article that inspired Kurt can be found here. He human hand is one of the most impressive pieces of machinery – biological, mechanical, or otherwise – that you’ll ever lay eyes on. With two dozen degrees of freedom, the hand can gently caress the most fragile flower petal without bruising it, or beat a hammer into an anvil with tremendous force. Simulating the human hand, however, is quite a challenge that requires dozens of servos and complex mechanical linkages. [Tomdf] over on Instructables is able to create hands, tentacles, and other weird biological contraptions using spring-loaded drinking straws and custom-made 3d printed joints. [Tomdf] got the idea for drinking straw phalanges after seeing a few 3D printed drinking straw connectors meant to be used for creating 3D objects out of disposable plastic tubes. After designing a new spring-loaded joint for drinking straws, [Tomdf] is able to add a few lengths of thread to serve as ligaments to control the segments of drinking straws. It’s a similar setup to the horrible demon spawn we saw at Maker Faire last year, but far more extendable for any project that might pop into your head. You can check out the drinking straw tentacles in action after the break. So we saw this tip come in and thought–oh, another POV device. We watched the video (embedded after the break), took a sip of coffee, then almost sprayed the beverage all over the computer when we realized that this uses a diy sensor to synchronize the POV image. [Ch00f] came up with the idea for the sensor after seeing a similar implementation on a commercial POV toy. 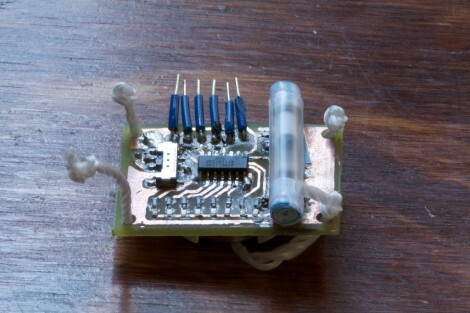 Instead of using a proper accelerometer to sense the motion, the toy uses a plastic bead in a channel. When you move the body of the toy the bead rolls to one end or the other, covering or exposing a reflective sensor. A similar sensor is used here. A drinking straw servers as the channel, with a paper-covered nylon screw as the bead. [Ch00f] cut a window in the bottom of the straw for his reflective sensor, then sealed each end with a wad of paper. This method works, but not as well as he had hoped. It seems the refresh rate and timing of the particular sensor he’s using is rather poor. If it were replaced with one that is simply and IR LED and phototransistor (like the sensors from [Jack’s] last video) he thinks it would work a lot better.